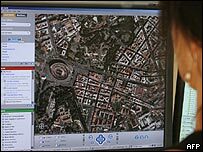 A Californian company has created software that can layer relevant recorded sounds over locations in Google Earth, New Scientist reports. Wild Sanctuary has over 3,500 hours of soundscapes from all over the world. The firm is in talks with Google, although no official agreement has yet been made. Its director, Bernie Krause said: "A picture tells a thousand words, but a sound tells a thousand pictures." Dr Krause has spent the last 40 years collecting sounds, and his recordings include more than 15,000 animal noises, and sounds from a huge array of habitats, including cities, deserts, mountains and the marine environment. It is the largest library in existence of natural sound, he said. He said the idea would be to zoom-in on a particular area and then have the option to listen to the accompanying sound. "It could be a real beneficial add-on," he said. The software is to be presented at the Where 2.0 conference in San Jose, California on 29 May. Mr Krause said up to two dozen sounds would be show-cased at first, but many more would be added later. If the project is successful, he would also like to use Google Earth to show how sounds change with time. He said: "People will be able to get a sense of before and after. "For example, people are talking about how selective logging is an appropriate way of not harming the environment. "But we have evidence that from the sound perspective, selective logging has a profound effect on the natural world. The pictures of before and after look exactly the same, but the sound is completely different."